Nikken Kosakusho Europe Ltd has an efficient service department located at the Euro Centre premises in Rotherham, South Yorkshire. Our impressive service area was completely refurbished just a few years ago with new workbenches equipped with their own electricity supply, compressed air and everything else a skilled engineer requires to prepare, service or refurbish a quality CNC Rotary Table originally manufactured in Osaka by Nikken Kosakusho Works Ltd.
Whatever your specific requirement our trained engineering and service team will endeavour to accommodate them in a timely fashion. Our workmanship is of the very highest standard and whatever the size of job we would be delighted to provide you with a quotation. 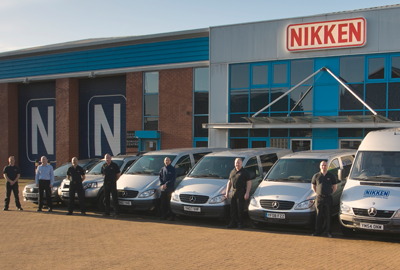 Please take a look around the service section of this web site to find out more about just what the Service Department's team at Nikken Kosakusho Europe Ltd offer our ever expanding customer base.